It's the last day of the month of March 2017 and it's time to say Goodbye to March 2017. This version of March was in the line of expectations of how a March around Koh Samui should be, sunny and warm and slowly starting to get warmer towards the end of the month and prepare us for the hottest month of the year; April. We had plenty of sunny days with hardly any showers at all, expect for last Tuesday and Wednesday when we had rather unusual hard rain for two days at this time of the year. We can easily file March 2017 version away as a nice month! Whoever was on Koh Samui during this month, I hope you enjoyed it. Half of this month I was on the road, with a stint on Phuket and currently on Koh Lanta, both for PADI IDC programs that I teach. One week, between my travels to Phuket and Koh Lanta, I was also working as an operator in the hyperbaric chamber on Koh Samui. 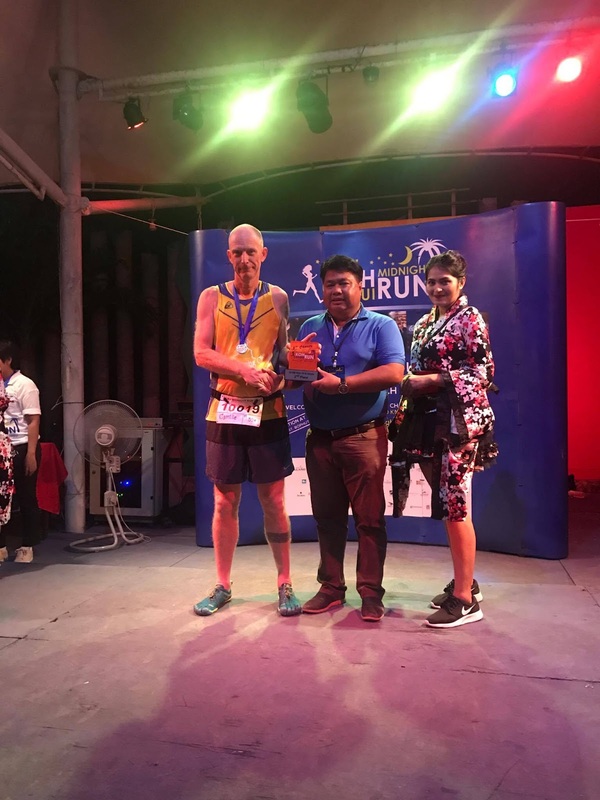 The night before I travelled to Koh Lanta I participated in the 5th version of the Koh Samui Midnight Run and I managed to come in second in my age group and sixth overall in the 10km race. Now it's time to look ahead to April, where we can celebrate Songkran, the Thai New year, an event you don't want to miss, providing you're in Thailand. It looks I will be on Koh Samui, so hope to see you there, come 13th and 14th April! Koh Samui, Thailand weekly weather update; 20th March – 26th March, 2017; Last night saw the 5th edition of the Koh Samui Midnight run, a charity event, in which I placed second in my age group of over fifties and sixth all over. The fourth time I participate and the fourth time I place second in my age group, despite the fact that I become faster each year. This year I was two and a half minutes compared to last year. The person who won my age category was however four minutes faster than me, so a fair win and he placed third all over. This week I have received many question about the weather coming op next week(s), The forecasts are working with precipitations, which means that even if there's the slightest chance of rain or a thunderstorm that day, the icon of rain or a thunderstorm will show up. This doesn't mean at all that there will be either rain let alone a thunderstorm. For our next week on Koh Samui, it's looking good, considering there's a real heavy rain and storm over Central Thailand (around Bangkok) and the North and North East of Thailand. The South may get some rain but nothing compared to the line North of Bangkok. Expect some rain on Monday evening and throughout Tuesday and the rest of the week should be lovely, with a the odd chance of a shower. The end of March and April are considered to be the hottest time of the year on Koh Samui and any rain is actually nice and will cool things down a bit. Enjoy next week and no reason to panic, there will be plenty of sunshine laying ahead of us. My students from the March 2017 PADI IDC on Phuket are currently participating in their last segment of the PADI IE and if they they pass this, should be brand new PADI Open Water Scuba Instructors. This morning I participated in the Supersports 10 Mile International Run at the Thanyapura sports complex, where I ran 16.25km in 1:19'11.2 or with a 4'52 pace and finished 57th out of 758 participants and 8th in my age group of 50-59. Half way through the race I had to drop the race pace since a hamstring played up. Tomorrow we're off again back to Koh Samui. Last week was a great week for the weather and sun fans with mostly blue skies and occasionally some clouds but no rain, Temperatures ranged from 30 to 33C, it's slowly heating up. A good time to be on Koh Samui and enjoy all it has to offer, the beaches and attractions. The forecast for next week is looking really good, it will continue to heat up with sunny skies and some clouds and come Thursday the wind may pick up a bit. Enjoy your time on Samui and the great March weather we're having. 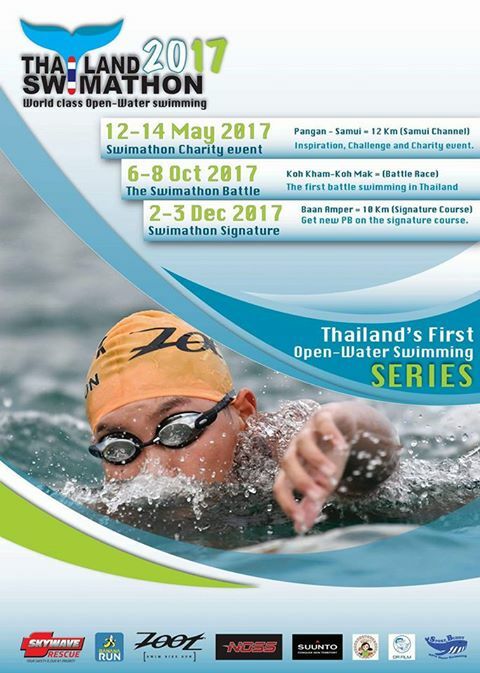 There will be an Open water swimming event between Koh Samui and Koh Phangan, Saturday 13th May 2017 at the Ibis hotel in Maenam. This is a charity event but it's not for the fainthearted. The swim distance is 12km in the Samui-Phangan shipping channel and before you can register you need to meet a few prerequisites and rightly so. - Security team and medical service from top hospital. - Certificate with wooden frame. 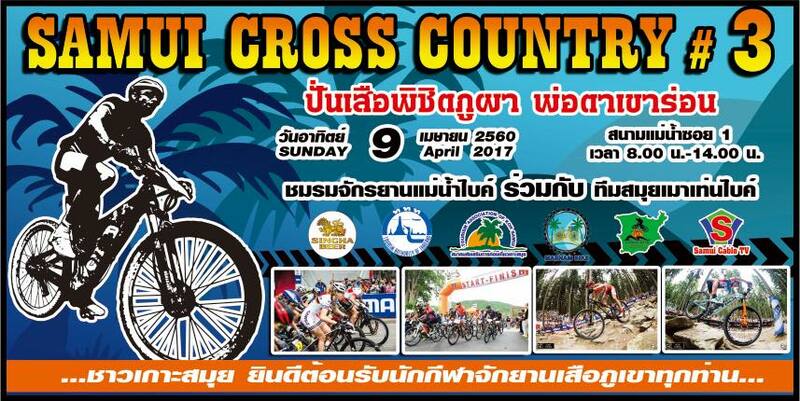 A real challenge and a very interesting addition to the Koh Samui sports and event calendar. Find out more about the event in this link. 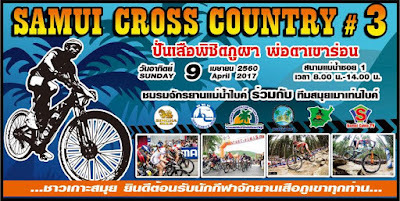 The next Samui Cross Country # 3 Sunday 9th April, 2017 is coming up next month and it's well worth a visit. Last year the second edition of this event was held in early January, which made for nice weather conditions, seeing this event during most of the day under the hot April sun is going to be an interesting development. I thought it was already hot last year when I went to see the event. Since I don't own a MTB or cross bike or for that matter a bike at all, very untypical Dutch behavior, I know, I won't be participating, but providing I'm at home, I will make sure to visit during the early morning, since it's a great event to watch for a an hour or so. Last year the event was held in Soi 1 in Maenam, the short cut road between Maenam and Lamai and they start at 8am, a good time to be there, later during the day it will become too hot! This year it will be held at the same location. Cycling is enormously popular in Thailand, the last couple of years it really skyrocketed in popularity, much more than my favored sport, running. Last years event was very well attended, and although I couldn't really make sense out of all the available categories, all the categories that I did watch, had big groups of participants at the starting line. Hope you find the time to either participate or to visit and have an enjoyable day come Sunday 9th April at Soi 1 in Maenam. Hope to see you there. It's already late today but here's the Koh Samui, Thailand weekly weather update; 6th March – 12th March, 2017. Today was a nice and warm day around around Koh Samui with a current temp at 8pm of 28C. The steady March weather held nicely on today. Since Wednesday I find myself back on Phuket once more, for the March 2017 PADI IDC program in conjunction with PADI CDC Center 'Dive Asia'. 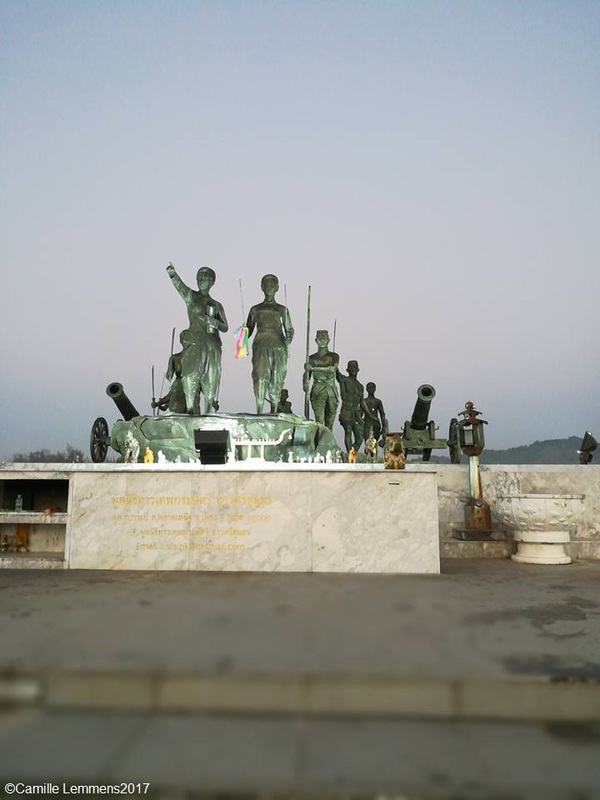 Koh Samui, Thailand weekly weather update; 6th March – 12th March, 2017; The main building, the Bot, at Wat Chaweng has been completely painted white and looks very impressive and beautiful now. Well worth a visit to check it out. Last week was really nice on Koh Samui with a mix of partially clouded to blue skies without rain. Max temperatures ranged from 30 to 32C and this is exactly what early March weather should be like. It's slowly warming up, day by day almost and by the end of the month we should have the hot temperatures that April is so well known for. Koh Samui, Thailand weekly weather update; 6th March – 12th March, 2017; The bigger but lesser known monument for the two sisters, considered heroins on Phuket, in the Thalang area, kind of in the middle of Phuket. I participated in a so called 'mini marathon' here today, a race over 10.82km which I managed in 47'57.8 minutes or a 4'25 pace and placed 5th in my age category. The forecast for the next week is looking really good, with mostly blue skies and occasionally a partially clouded sky with maybe a short thunderstorm and shower towards or around next weekend. Enjoy what Koh Samui has to offer and I hope you find what you're looking for on our lovely island! It's time for the Koh Samui, Thailand weekly weather update; 27th February – 5th March, 2017, starting with today's update. Last week didn't start very good and the last two days of February saw plenty of rain with Monday actually having storm like weather and some flights to Koh Samui had to be diverted to Phuket instead. By Wednesday the weather had recovered a bit already and there was some afternoon rain only. Thursday and Friday saw some night rain and since yesterday it's been glorious again, full on sunshine and mostly blue skies. Just like March should be. It's still nice and agreeable weather and it's too hot yet but each week the temperature will increase to reach real high levels come April. The forecast for next week is looking good. The good weather is to continue with mostly blue skies and sunny days in real March style. Enjoy your time on the island and check out the options that I can recommend as listed below during your stay on the island. My favorite hobby has another event on Koh Samui; The 8th Koh Samui mini marathon, Sunday 28th May 2017. Yes indeed, another running event has been added to the Koh Samui race calendar and it looks that I will be on the island that day and can participate, in contrast to last year, when I missed the race while I was not on the island. The races on offer are a 10.5km mini marathon distance race with a 6am start and a 5km fun run distance race with a 6.20am start. Providing I stay healthy, I', looking into a top ten overall finish and top three finish in my age category but ideally a win in that age category of 55-59 years! For the overall winner there's a 1,000.-THB, 800.-THB and 500.-THB price for up to 18 years and in the open category, plus all top ten finishers in each category will receive a trophy and all 10.5km runners receive a medal upon completing the race and the first 750 fun run finishers receive a medal. Online registration can be done on this page and all other relevant information regarding the race can be found there as well, in Thai and in English. The participation fee is 100.-THB for the fun run or 50.-THB for Koh Samui students and 200.-THB for the mini marathon. Hope you will come out 'en masse' and enjoy an early morning run. A lot of the regular Samui runners will already be in the final stages of their marathon training plans for the Boutique Koh Samui marathon, come Sunday 25th June and the mini marathon will be a great training opportunity. Do not be surprised if some of us will add extra time or km's to fulfill the needed quota for the day, as part of our respective training plans. Hello and it's that time of the month where we can say; 'Welcome to March 2017'. This month, March is one of those 'hidden gems' on Koh Samui, a lovely month with usually nice weather conditions, plenty if sunshine, not too hot and hardly any rain. Besides 2011, this was delivered each recorded month by me, since 2007! The start of this month doesn't look any different, some rain yesterday afternoon but the sun is battling it out with the clouds today and the next seven days should see partially cloudy skies, which means, plenty of sunshine to enjoy the beaches around the island or explore the island on day tours and trips. Welcome to March 2017; A building in Wat Suanthamma near Nathon and next to the Hin Lad waterfall. A beautiful and tranquil temple, located in the jungle near the waterfall, a very quiet and lovely place to visit with plenty of buildings and statues and other interesting views to explore and experience. Later this month will see the already fifth edition of the Koh Samui Midnight run, and I will be here to participate and hopefully will finally be able to get that first spot in my age category! This will be on the night of Saturday 25th to Sunday 26th March. Hope to see you there. First things first though, this coming Sunday will the next Samui Green Market at the Elysee Boutique Resort in Fisherman's Village, with a 3pm start, hope to see you there. Enjoy this March 2017 version, the start of this month looks very promising on the weather front, so make the most out of your stay on the island. The Next Samui Green Market Sunday 5th March at Elysee Boutique Resort in Fisherman's Village. As always the start is at 3pm or 15.00 and the show is over around 6.30pm. In the meantime, you can get your fix of bread, locally made, locally grown, locally packaged, healthy organic food & vegan food, freshly roasted coffee, home-made breads & pastries, raw desserts & sweets, probiotic soft drinks and homemade chocolate & cheeses. Or how about some organic soaps & shampoos, arts, craft and games, yoga goods, second-hand books & clothes, solar technology & solar ovens, organic garden & aquaponics, trash recycle station, alternative healing therapies & massage and Trash Hero steel water bottle free refilling station for live structured “Kangen” water. Plenty to check out and experience, taste and buy, but, please do bring your own non plastic bags! You can also enjoy the food on offer, from the vendors and from the Elysee Boutique Resort's own kitchen, they always come up with some good and enjoyable food. Hope to see you there, I know I will be there!